In 2002, American Rivers named the Guadalupe one of America’s most endangered rivers, citing a significant amount of water diversion and the lack of any commitment to maintain sufficient river flows as the Guadalupe’s main threats. According to the River Systems Institute at Texas State University, the Guadalupe River Basin is one of the nation’s most rapidly urbanizing and ecologically significant regions. The increasing demand for water resources has forced the Guadalupe-Blanco River Authority (GBRA) to focus its planning efforts on municipal and industrial needs rather than the lower basin needs of the bays and estuaries of the Texas Coast. As a result, the coastal ecosystems are not a priority in the Guadalupe River Basin water planning. In a region with recognized water shortages, permits for massive quantities of water for industrial and municipal uses continue to be requested and granted. While water management officials insist there is enough freshwater, coastal communities are facing a very different physical reality. The Texas Commission on Environmental Quality (TCEQ) controls the water permit process in Texas. TCEQ’s permits authorize the use of surface water rights from the Guadalupe River Basin and such diversions reduce necessary freshwater inflows to the bays and estuaries. The GBRA acknowledges that any new permits for water diversions from the basin will be subject to the environmental stream flow conditions to be imposed by TCEQ for the protection of San Antonio Bay and its estuaries under Senate Bill 3 (SB3). 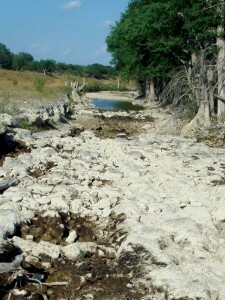 While the current environmental flows process established under Senate Bill 3 (SB3) will go a long way to establish the much-needed environmental flow standards for basin and bay systems across Texas, SB3 falls short in this basin because does not have the scope or jurisdiction to protect the cranes nor to remedy the over-allocation of water resources in this basin that already exists. The Edwards Aquifer Recovery Implementation Program (EARIP) does not have the scope to help coastal endangered species. Unless the use of both existing water rights and pending water rights are addressed in some manner, especially during low flows, the cranes and the bays will continue to be impacted. At this time, there are over 100,000 acre feet of existing water rights in the Guadalupe Basin that are not being drawn from the river yet. If these were fully utilized, low flows would be further reduced. This is why the reservation of 75,000 acre feet for a proposed Exelon Nuclear power plant from these existing water rights is so important, not to mention the permits for additional future water rights that were recently filed by the GBRA. (GBRA submitted an application to TCEQ for 189,484 acre feet of unappropriated flows of the Guadalupe River in Calhoun County.) This will give GBRA more than six times the amount of water supplies that it needs for the next 50 years. The Guadalupe Basin lacks the stewardship needed to strike a balance of all interests throughout the basin and bays, especially during times of natural low flows. The “plan” in place now is not really a plan; it is a list of projects that may or may not happen. This basin needs a sound water management plan backed by scientific research and endorsed by public review. Even though coastal communities are the first to feel it, a flawed water management plan endangers the livelihood of everyone that relies on the Guadalupe River Basin for stability and prosperity. If the bays are unable to survive, it is only a matter of time before the entire river basin is put in jeopardy because mismanagement in any part of the basin threatens the future of the rest of the basin. For the past few years, Texas has been experiencing one of the worst natural droughts of the last 50 years, resulting in over $4 billion in agricultural economic losses. While the natural drought conditions will come and go, we risk perpetuating these low flow conditions if we allow continued diversions of water from this river system – especially for water that may or may not exist except on paper – and that is not available when rainfall is low. The full use of existing water commitments and the continued permitting of new water will dramatically increase the salinity levels of the bays and estuaries. TAP computer modeling based on state water models suggest that the instream flows to the bays and estuaries are being negatively impacted due to over-allocation for upper basin needs, which becomes manifest during a natural drought. If the bays are unable to survive, it is only a matter of time before the entire river basin is put in jeopardy because mismanagement in any part of the basin hurts us all. The approach for managing the water resources of the Guadalupe River Basin must change or we risk devastating economic and environmental damage to the Texas coastal ecosystems—and all that depend on them. Aransas area community members and officials discuss the implications of the Guadalupe River Basin management on their costal economy and ecosystems.